So, now that I’ve crossed over into my third trimester, I thought it would be a good time to review the second. In particular, how I managed my health naturopathically. I’d love to hear about your second trimester experiences too. Happily, most of the symptoms I experienced during the early stages of pregnancy (nausea, fatigue, sluggish digestion) did not travel with me into the second trimester. Instead, as the weeks rolled by, I started to feel like myself again… but even better… the magic of hormones! I’m sure I annoyed a lot of people by regularly commenting on how amazing I was feeling and how awesome pregnancy is*. Hey, cut me some slack… I’d been feeling pretty rotten up until that point! I told our midwife how excellent I felt and she smiled, saying that she would like to bottle that second trimester vibe. For most women, the second trimester generally is a pretty lovely time, as the more severe symptoms subside (or in my case disappear), you can finally tell everyone you’re pregnant AND you start to actually look the part. Such an exciting time! As the weeks progressed, my belly swelled to accommodate my rapidly growing baby and I loved seeing it round out; it made me look and feel ‘properly’ pregnant. It’s also normal to start feeling some movement – often described as ‘flutters’ or ‘bubbles’ – around this time… unless, like me, you have an anterior placenta. In this case, when the placenta sits at the front, it acts as a sort of insulator and means you’re not likely to feel movement until quite a bit later. I didn’t feel our baby moving around in there until well after 20 weeks (which stressed me out a little as I wanted to know that everything was ok!) but now that I have, this kid never stops! While my first trimester was typified by aversions, my second was filled with cravings. I was feeling good, I was hungry, and there was a tonne of good food available courtesy of summertime and festive season abundance… I confess to regular fruit mince pie enjoyment – ’twas the season! – I felt I had to sample as many as I could (and was sorry to find that Heston’s did not live up to the hype). My biggest and most consistent craving was for dairy foods. 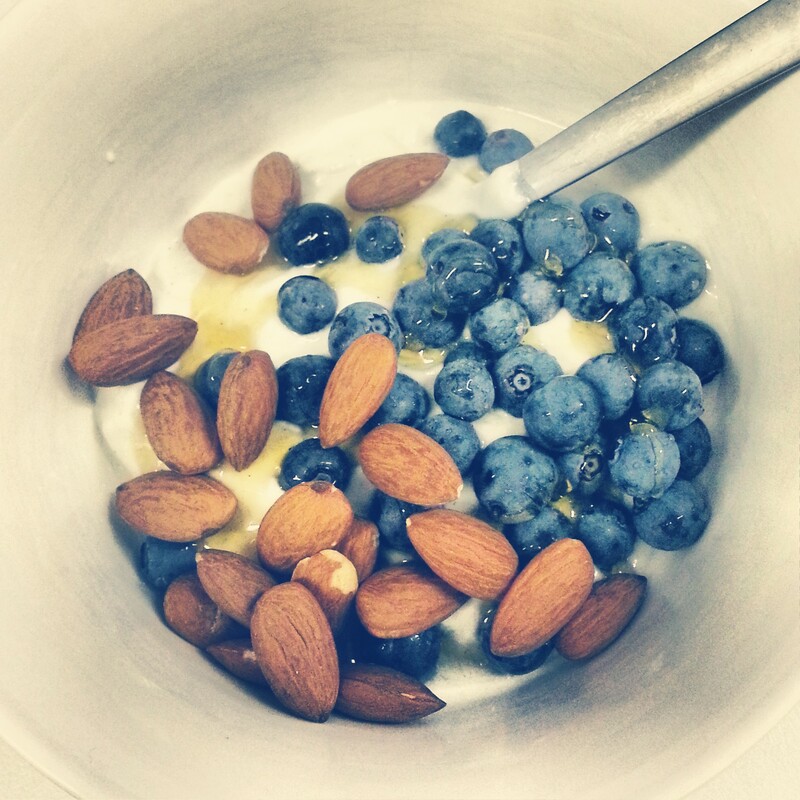 HEAPS of dairy, especially cheese and yoghurt, which I incorporated into snacks and main meals. Normally that volume of dairy wouldn’t agree with my digestion, but it didn’t cause me a problem this time. It helped that I made good choices, which were slotted it into my otherwise healthy diet. Though, there were also a number of uncharacteristic moments… such as when Jon caught me spooning double cream directly into my mouth one afternoon (! 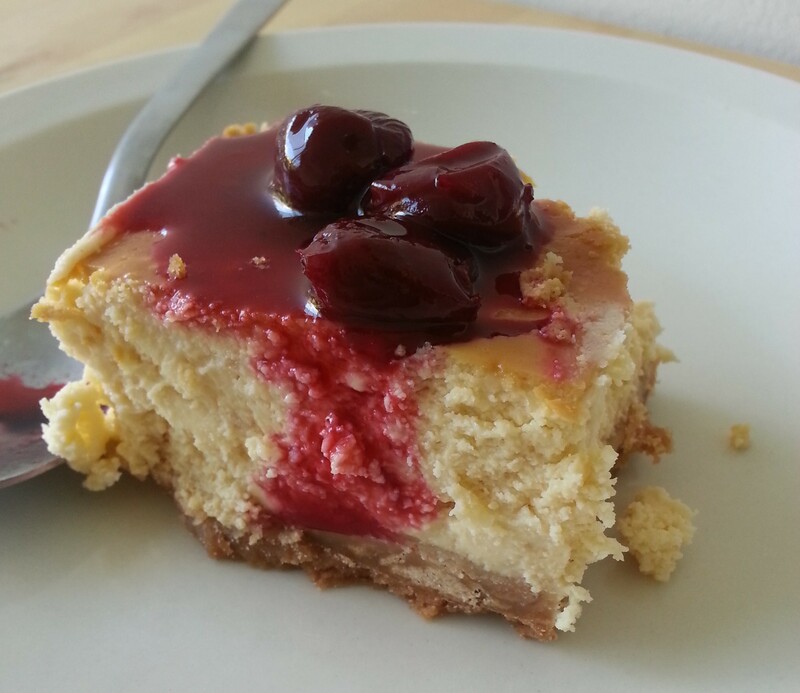 )… or when I baked us a sour cherry cheesecake that I consumed entirely within several days (was delicious). I wanted to eat this. ALL the cheesecake! … but I often settled for something like this. Much healthier, still delicious AND satisfied cravings. Cravings often provide clues to our changing nutritional needs during pregnancy and it’s important to honour what your body tells you. BUT it’s also important to recognise that craving something unhealthy (e.g. bowls of ice-cream, fast food, etc) doesn’t mean your body needs that specifically, rather it’s looking for certain ingredients found within those foods. If you use the example of me and the cheesecake, I certainly didn’t need numerous slices daily (delicious though they were!) but the calcium and fat contained therein. While I see no problem indulging in delicious foods, a regular and /or high consumption certainly isn’t recommended and could compromise the health of you and bub. I will write a longer post on this in the coming week, as I think it’s a topic worth discussing in more depth. Staying active throughout pregnancy is beneficial and highly recommended. However, the level of activity needs to be adapted to you: some people can still keep running half-marathons through until they’re almost full term (I have one gorgeous new mama I know in mind), whereas others are better suited to gentle, low-impact movement. For me personally, as soon as I felt my energy returning, I started back into regular exercise. I’ve always been someone who enjoys engaging in exercise, as it does excellent things for both my physical and mental health. I like being able to do something high intensity several times a week, balanced by something more gentle (e.g. yoga, swimming, light walk) on the other days. As my belly started to become more and more obvious, however, I needed to adapt my previous practice. I had a trainer go through an adjusted weights program with me at the gym, one that would still maintain strength and get my heart rate up, but not squash my baby. I also continued a regular yoga practice (a mix of at home and classes). I walk everywhere too, including to-from work, which certainly adds up – incidental exercise for the win! Towards the end of my second trimester, at around 24 weeks, I started feeling tired again and wasn’t enjoying the gym anymore. So I decided to stop going. Absolutely no point doing something that doesn’t feel good! Walking, yoga and occasional swimming were, and continue to be, enough for me now. Sooooo happy to be preggers! As I write this I’m now 29 weeks and feeling pretty good. My belly – and belly button! – seems to be growing outward at a rate of knots and the regular movements of our baby can often be seen from the outside. 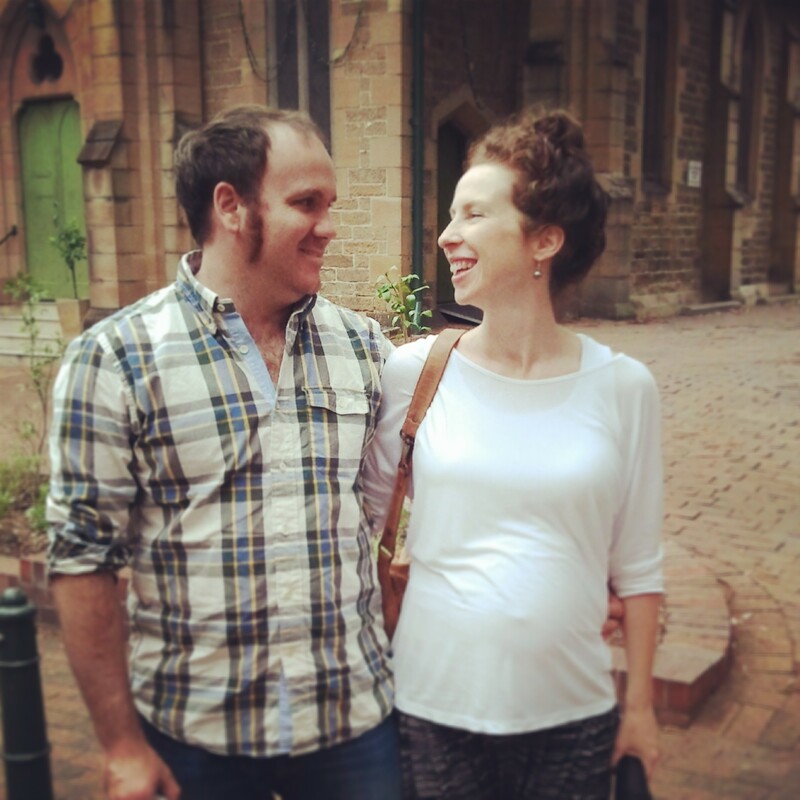 Jon and I wonder what she’ll be like on the outside – as busy as in utero? – but know we don’t have long now to find out! Also pregnant? What stage are you at? Similar experiences? What have you found works best for you? * Pregnancy IS awesome by the way, even when you feel sick and/or tired and/or full of baby. It is completely and utterly rad. You’re growing another human inside you! Amazing. So glad you’re feeling well Kath! Thanks Sandy, I like sharing this journey, it certainly is an interesting one… well to me it is 🙂 Yes, the whole dairy thing is intriguing hey? I’ve known a number of people who had high level intolerances to certain foods that seem to disappear during pregnancy. I’m not intolerant to dairy, but can’t eat bucketloads… well, not normally, now is the exception! I like the homeopathic view of pregnancy as a remedy – fascinating!